SomoS is pleased to announce the Sound-art installation and performance series “Telix” by visual/sound artist, instrument builder and composer Thessia Machado (US/BR), presented at the SomoS gallery space from May 17th – 20th 2017. The event takes place within the framework of Thessia Machado’s “Inga Maren Otto Fellowship in Music Composition” of The American Academy in Berlin as member of its Spring 2017 Class of Fellows. Machado’s installation features wall-mounted, photosensitive sound modules, which are conducted by light patterns from a graphic score traveling on a mechanical apparatus built from a deconstructed fax machine. Several performances and an artist’s talk with noted fellow sound-artists are scheduled around her installation. Between Thessia Machado and Sound-artist and educator Volker Straebel,, Head of department, Sound Studies and Sonic Arts, Universität der Künste Berlin. Thessia Machado – handmade electronics and DC motors, and Sound-artist Pedro Lopes – turntable percussion. Pedro Lopes is a turntablist, computer scientist & “hardware t(h)inker.” An innovative Sound-artist who breaks this discipline’s increasingly academic mold, Lopes has defined a very personal interpretation of Turntablism, best described as “turntable persussion. Thessia Machado – handmade electronics and DC motors, and multi-instrumentalist Theresa Stroetges, of Golden Diskó Ship. Thessia Machado is a visual/sound artist, instrument builder and performer whose work investigates the physicality of sound and its effect on our perception of space. In sculptures and interactive installations that have a real-time, live component, the expressive potential is still active and changeable. As a extension of this practice, and under the moniker link, she also performs electronic and electro-acoustic experimental music with hand-made and modified instruments. Thessia’s installations and video pieces have been exhibited in New York, London, Philadelphia, Paris, Amsterdam, Dublin, Berlin and Athens. She has been awarded residencies at Homesession, Barcelona, the NARS Foundation, NY, I-Park, MacDowell Colony, Yaddo, the Atlantic Center for the Arts, the Irish Museum of Modern Art and the Vermont Studio Center and is a recipient of fellowships from the New York Foundation for the Arts, The Experimental Television Center and The Bronx Museum. 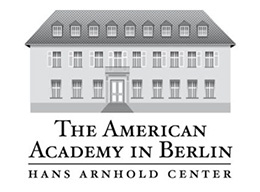 Organized by The American Academy in Berlin, in cooperation with the Technische Universität Berlin, and Universität der Künste Berlin.